HTTPS stands for Hyper Text Transfer Protocol Secure. It is a protocol for securing the communication between two systems e.g. the browser and the web server. As you can see in the above figure, http transfers data between the browser and the web server in the hypertext format, whereas https transfers data in the encrypted format. Thus, https prevents hackers from reading and modifying the data during the transfer between the browser and the web server. Even if hackers manage to intercept the communication, they will not be able to use it because the message is encrypted. HTTPS established an encrypted link between the browser and the web server using the Secure Socket Layer (SSL) or Transport Layer Security (TLS) protocols. TLS is the new version of SSL. SSL is the standard security technology for establishing an encrypted link between the two systems. These can be browser to server, server to server or client to server. Basically, SSL ensures that the data transfer between the two systems remains encrypted and private. The https is essentially http over SSL. SSL establishes an encrypted link using an SSL certificate which is also known as a digital certificate. 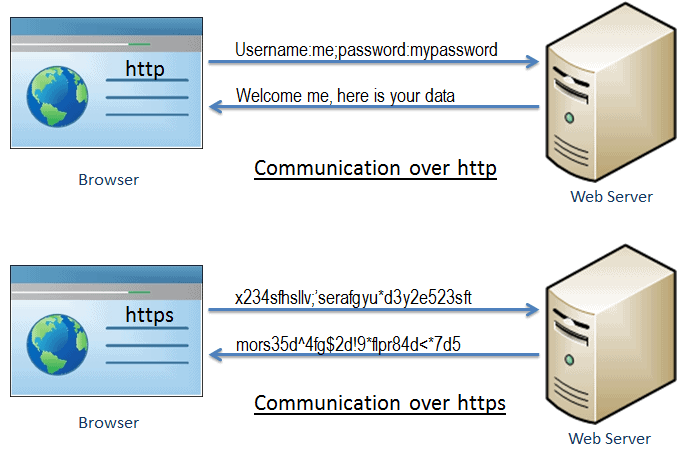 Secure Communication: https makes a secure connection by establishing an encrypted link between the browser and the server or any two systems. Data Integrity: https provides data integrity by encrypting the data and so, even if hackers manage to trap the data, they cannot read or modify it. Privacy and Security: https protects the privacy and security of website users by preventing hackers to passively listen to communication between the browser and the server. Faster Performance: https increases the speed of data transfer compared to http by encrypting and reducing the size of the data. SEO: Use of https increases SEO ranking. In Google Chrome, Google shows the Not Secure label in the browser if users' data is collected over http. Future: https represents the future of the web by making internet safe for users and website owners. Learn about the SSL certificate in the next chapter.